A cancer diagnosis is a scary experience no matter who you are – and at Orange County CyberKnife, our mission is to help you get through it and come out the other side healthy and happy. As a leading radiation oncology clinic serving the Orange County, CA area, we’re proud to offer high-quality radiation therapy treatments including CyberKnife. We treat virtually every form of cancer, and even when a patient’s condition is quite serious and advanced, we believe there’s always hope. If you or a loved one are suffering from any form of liver cancer, we’re here to help. 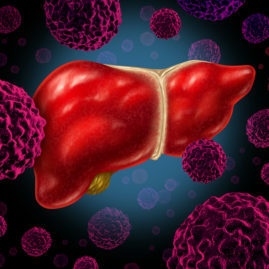 Primary liver cancer describes cancer that originates in the liver, as opposed to metastatic liver cancer, which occurs cancer spreads to the liver from another part of the body. There two types of primary liver cancer: hepatocellular carcinoma (HCC) and cholangiocarcinoma. 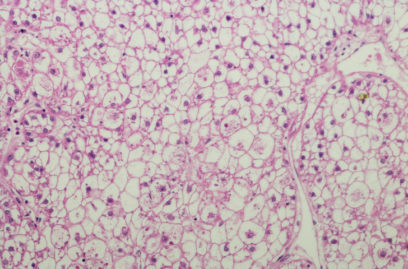 HCC is usually caused by liver cirrhosis, which most commonly comes from alcoholism or hepatitis C in the US. In addition to these risk factors, HCC has also been linked to obesity, exposure to certain chemicals, hepatitis B, and use of anabolic steroids. Every patient is different, and you’ll work with your treatment team to choose the treatment that’s right for you. Cholangiocarcinoma, or bile duct cancer, is the other form of primary liver cancer, and unfortunately it’s very aggressive and often lethal. Cholangiocarcinoma is rare, with only 5,000 new cases each year, but it grows quickly and is difficult to cure. Where possible, surgical resection of the liver or liver transplant are the preferred treatment methods. If surgery isn’t an option, we can use chemotherapy or radiation to manage the condition, but not cure it. T – Tumor: The first variable measures the size of the tumor in centimeters, and also whether or not it has grown into nearby blood vessels and organs. N – Node: The second variable denotes if the cancer has spread into the nearby lymph nodes, which are bean-shaped organs making up part of the immune system. M – Metastasis: The final variable denotes whether or not the cancer has spread (metastasized) to distant regions of the body. Each of these variables is graded on a scale of 0 to 4, where 0 is the least severe and 4 the most. In addition, letters are added to the grade to demarcate certain stages. T1: A single tumor, of any size, that has yet to grow into blood vessels. T2: Either a single tumor that hasn’t grown into blood vessels OR more than one tumor but all tumors are less than 5 cm across. T3a: Multiple tumors, with at least one tumor larger than 5 cm across. T3b: At least one tumor of any size that’s grown into a large vein like the portal or hepatic vein. T4: A tumor of any size that has grown into a nearby organ OR that is growing into the visceral peritoneum, a thin layer of tissue that surrounds the liver. NX: We cannot assess the nearby (regional) lymph nodes. N0: The tumor hasn’t spread to nearby lymph nodes. N1: The tumor has spread to nearby lymph nodes. M0: The cancer has not spread to distant sites. M1: The cancer has spread to distant sites, often to the lining of the belly (peritoneum), the lungs, or the bones. After grading the T, N, and M variables, your doctor will combine them to assign an overall stage of the cancer. This stage uses Roman numbers 1 to 4 to describe the overall severity of the cancer. Stage I – T1, N0, M0: A single tumor of any size that has yet to spread into blood vessels, lymph nodes, or distant sites. Stage II – T2, N0, M0: Either a single tumor of any size that has grown into blood vessels OR several tumors that are all 5 cm or less across. In either case, the tumor hasn’t spread to lymph nodes or distant sites. Stage IIIA – T3a, N0, M0: Multiple tumors with at least one being more than 5 cm across, none of which have spread to lymph nodes or distant sites. Stage IIIB – T3b, N0, M0: At least one tumor has grown into a major vein of the liver, but none have spread to lymph nodes or distant sites. Stage IIIC – T4, N0, M0: Either a tumor has grown into a nearby organ like the gallbladder or has grown into the covering of the liver, but has not spread to lymph nodes or distant sites. Stage IVA – Any T, N1, M0: Any size or number of tumors that have spread to nearby lymph nodes but not distant sites. Stage IVB – Any T, Any N, M1: Any size or number of tumors that may or may not involve lymph nodes but have spread to distant parts of the body. Liver cancer is a serious condition at any stage – but with early detection and the right cancer treatment, there’s always hope. OC CyberKnife has helped thousands of patients across the Orange County area take hope in their fight against cancer, and we would be thrilled to help you do the same. Call us today at 714.962.7100 to find out how our state-of-the art cancer treatments can help you beat cancer, recover, and return to a healthy, normal life.